There are 14 Memory Care Facilities in the Seattle area, with 9 in Seattle and 5 nearby. The average cost of memory care in Seattle is $4,658 per month. This is higher than the national median of $4,650. Cheaper nearby regions include Bellevue with an average starting cost of $4,455. To help you with your search, browse the 1 review below for memory care facilities in Seattle. On average, consumers rate memory care in Seattle 5.0 out of 5 stars. Caring.com has helped thousands of families find high-quality senior care. To speak with one of our Family Advisors about memory care options and costs in Seattle, call (855) 863-8283. Seattle is the largest city in Washington State, where the U.S. Census Bureau puts the city's official population at 724,000 residents. Over 110,000 people in Washington have Alzheimer's disease, and more still have some other form of dementia that requires a residential care option. Memory care is the most common choice for families looking for a place to keep a senior loved one safe and healthy. Seattle has at least 28 licensed memory care facilities either within its borders or close enough to easily visit loved ones. In these facilities, seniors with Alzheimer's disease and dementia are looked after by professionally trained staff, and the facilities work to keep their patients' doctors and families involved with their continuing care. Weather in Seattle is famously rainy, although this reputation is somewhat exaggerated. In fact, the city gets just 34 inches of rain a year, with roughly 213 rain-free days to enjoy from late spring to early fall. Summer highs average 72 degrees Fahrenheit, and seniors with asthma may wish to stay indoors when the heat and humidity kick up allergens. Seattle is a big city, so it shouldn't be a surprise that living there can get pricey for aging citizens in memory care. The cost of living in the city area can be 49 percent higher than the nationwide average. Seniors should expect to pay higher prices for health care and transportation than in other cities of the Northwest, such as Olympia or even neighboring Tacoma. Crime in Seattle is a more serious issue than elsewhere in the state. Violent crime rates are double the Washington average, while property crimes are around 50 percent higher than the rest of the state. Washington is relatively peaceful, though, so Seattle's crime rate is still lower than the national average in most categories. Seattle is home to world-class medical facilities, including those specializing in brain health and dementia care such as University of Washington Medical Center and Virginia Mason Medical Center, in the event of medical emergencies or illness. Memory Care costs in Seattle start around $4,658 per month on average, while the nationwide average cost of memory care is $4,799 per month. It’s important to note that memory care rates in Seattle and the surrounding suburbs can vary widely based on factors such as location, the level of care needed, apartment size and the types of amenities offered at each community. 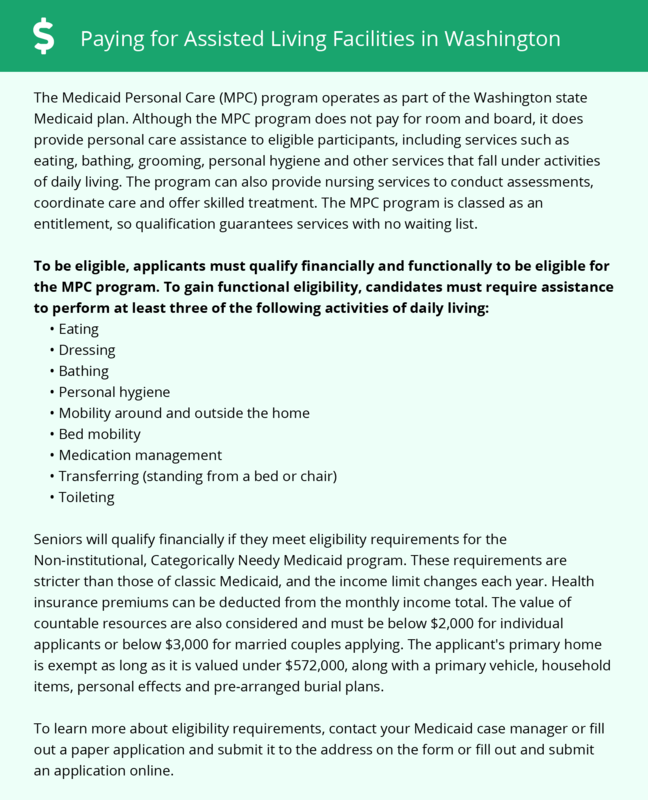 Seattle and the surrounding area are home to numerous government agencies and non-profit organizations offering help for seniors searching for or currently residing in an assisted living community. These organizations can also provide assistance in a number of other eldercare services such as geriatric care management, elder law advice, estate planning, finding home care and health and wellness programs. To see a list of free memory care resources in Seattle, please visit our Assisted Living in Washington page. Seattle-area assisted living communities must adhere to the comprehensive set of state laws and regulations that all assisted living communities in Washington are required to follow. Visit our Memory Care in Washington page for more information about these laws.